Bring retro flair to your next shindig with these etchable mixtape glasses. 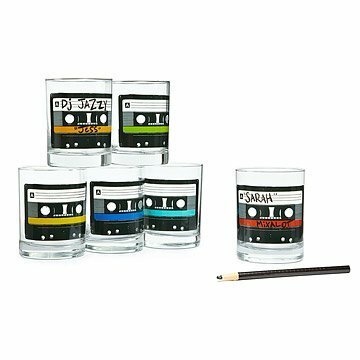 Take all-occasion glassware on a retro rewind with these colorful mixtape glasses. The blank tape allows partygoers to write their names or favorite power ballad on the cassette using the included wax pencil, giving you a personalized playlist and a great way to keep track of drinks. Glassware made in the USA, decorated in Las Vegas, Nevada. Visit our blog to see some of our favorite cocktail recipes and the mixtapes that go great with them. Top rack dishwasher safe. Wipe non-toxic wax pencil off with dry towel. Used one glass, put it in the dishwasher top shelf and the design came off and left flecks of design all over the inside of dishwasher and other dishes. Now I have 5 unused, cool looking glasses that I'm hesitant to use. They double as stemless wineglasses pretty nicely if I do say so myself! Fun original gift for my son's music teacher. Perfect for someone who entertains to keep everyone's glasses separate! My son is a musician and loved the retro mixtape theme (even though he's too young to even remember cassette tapes). It was a big hit. We bought two sets for a friend who just moved into his new home. He loved the quality of the glasses and its uniqueness as well. It was perfect for the housewarming party he threw! Everyone had their own glass and it was fun coming up with nicknames for each person and their drink of choice. My friends are huge music fans (of all kinds) and loved the style of cassette tape glasses. They are super excited to use them!